Objectives: The aim of this study was to design frameworks for the use of unlisted health technologies in emergency and quasi-emergency situations. Methods: We interviewed the representatives of patient organizations and analyzed related press releases from the main internet news portals in Korea to investigate the needs of patients. In addition, a literature review was conducted on the emergency use of unapproved drugs and medical devices in Korea. Results: Due to the current reimbursement listing system in Korea, there have been constant demands for unlisted technologies prior to their listing. Thus, we created two frameworks that allow for the use of those technologies in quasi-emergency and emergency situations. For quasi-emergencies, the MOHW must issue approval prior to use; in emergencies, unlisted technologies can be used without pre-approval. In both cases, however, implementing institutions have to report the results and the Committee for nHTA must review them for appropriateness. Conclusions: This paper will be the first attempt to develop frameworks for the emergency and quasi-emergency use of unlisted health technology. It will be a critical new tool to fulfill the need for timely and practical medical treatment or diagnosis that is currently unlisted in Korea. Internationally, an emergency medical condition is defined as “a medical condition manifesting itself by acute symptoms of sufficient severity (including severe pain) such that the absence of immediate medical attention could reasonably be expected to result in (i) placing the health of the individual in serious jeopardy, (ii) serious impairment to bodily functions, or (iii) serious dysfunction of any bodily organ or part” . An emergency use of drugs, medical devices, or health technologies is usually defined as “the use of unapproved drugs or medical devices in a life-threatening medical situation” . In the U.S., emergency or therapeutic use of unapproved drugs and medical devices may be permitted on a patient-by-patient basis through an Investigational New Drug (IND) protocol or an Investigational Device Exemption (IDE) in accordance with the Federal Food, Drug, and Cosmetic Act and the Code of Federal Regulations, Title 21 [3-6]. The application of IND requires Institutional Review Board (IRB) approval and informed consent from the patient or his/her legal representative [3,5,7]. Applicable cases include patients with serious, lifethreatening medical conditions as well as conditions that cannot be properly treated with the currently available drugs and treatment methods. In these exceptional cases, the therapeutic use of investigational drugs may be permitted after a clinical trial protocol is submitted by the medical professional intending to provide such treatment. In addition, emergency use of unapproved drugs and medical devices may be permitted in case of urgent situations, where there is no time to submit the clinical trial protocol [3-5,7,8]. Like in the U.S., in Europe, treatment using unapproved drugs and medical devices was made possible by clinical trials through the EC Clinical Trials Directive from 2004 . To follow the global trends, the Ministry of Food and Drug Safety (MFDS), the Korean regulatory agency for drugs and medical devices, allowed the use of unapproved or off-label use of drugs and medical devices under emergency circumstances from 2007 and 2005, respectively [10,11]. In the case of unlisted health technologies for treatment or diagnosis of diseases, there is a Waiver of Liability or Beneficiary Notice in the U.S. , and mixed care of newly developed health technologies in Japan . However, when a new health technology is introduced in Korea, it undergoes a new health technology assessment (nHTA) before a decision is made as to whether or not the technology should be included in the national health insurance (NHI) benefits coverage list. For reference, nHTAs are conducted by the Committee for nHTA, which is a MOHW committee . The data review, analysis, and administration work are conducted in the Center for nHTA in the National Evidence-based Healthcare Collaborating Agency (NECA), which is a MOHW-affiliated organization . Furthermore, there is no policy allowing for exceptions or granting permission for newly developed health technologies to be used in emergency or quasi-emergency situations without undergoing an nHTA. From the introduction of the nHTA System in Korea in June 15, 2007 to December 31, 2013, a total of 1,409 nHTA application forms were submitted. The period from the application to going through process is typically more than 200 days. Of the 640 technologies deemed to be subject to assessment, 458 were designated as new health technologies after their safety and effectiveness were confirmed through the assessment, and 126 were designated as “research-phase technologies” due to insufficient evidence for their safety and effectiveness. Research-phase and unassessed technologies cannot be used in the Korean healthcare system. Recently, however, the Korean government enacted a special policy called the “Temporary Approval of New Health Technology” for the use of research-phase technologies that do not currently have alternative treatments or diagnosis methods . However, the “Temporary Approval of New Health Technology” policy does not ensure the use of newly developed health technologies in an emergency or quasi-emergency situation. For this reason, many patients, industries, and health professionals have demanded to use newly developed health technologies in emergencies to expand the right of choice for medical treatment . However, if unverified health technologies are used carelessly, it can result in irreversible harm and monetary loss to patients. Thus, it is necessary to design a comprehensive framework for emergency and quasi-emergency use of unlisted health technologies according to a public health model, by considering the Korean healthcare system; the top priority must be to guarantee the safety of patients and provide them with the most benefits. To develop frameworks for the emergency and quasi-emergency use of unlisted health technologies, we interviewed representatives of patient and consumer organizations and analyzed related press releases to determine the social needs of patients. In order to investigate the needs of patients for unlisted health technologies in emergency situations, we conducted group interviews with representatives of patient and consumer organizations. To accomplish this, we requested recommendations for representatives who have a wide knowledge of medical services, and who can speak for the benefit of patients and consumers from patient and consumer organizations. We received a list of 3 representatives from the Korea Alliance of Patients and 3 representatives from the Korean National Council of Consumers. Both of these are representative, alliance organizations in Korea. Before the group interviews, we explained the purpose of the interview to the representatives and confirmed that they have no interests with specific medical devices, health technologies, or medical institutions. We conducted 2 rounds of interviews with the representatives of the patient organization and one interview with the representatives of the consumer organization. The contents of the interview were ① the need for the use of unlisted health technologies in emergency or quasi-emergency situations, ② specific needed areas or the order of priorities among unlisted health technologies, ③ if related health policies are made, what details have to be addressed, ? the willingness of patients or family members to pay the cost of unlisted health technologies with permission for use, ⑤ any other comments for the use of unlisted health technologies in emergency or quasiemergency situations. Interviews were conducted in a 2-hour group meeting led by the primary researchers (the authors), who also developed the contents of the interviews. The replies for each question were arranged descriptively and common replies were used as conclusions. To identify the existing demand from various interested parties, we analyzed the related press releases in the past 4 years in South Korea through a search of the 3 largest internet news portal sites: Naver (www.naver.com), Daum (www.daum.net), and Nate (www.nate.com). These portals contain all contents of the main media sources in South Korea. The exact search period was from January 2010 to April 2014 and search terms were selected by combining strings of the following terminology: “newly developed,” “unlisted,” “unapproved,” “health technology,” “procedure,” “emergency situation,” “approval,” and “right of patient.” After the search, we found a total of 87 press releases. However, through consensus of the researchers, we eliminated 32 press releases with the same or similar contents, 42 press releases that were deemed to be unrelated to the topic, and 6 promotional press releases of industries or hospitals. Finally, again, through consensus between the researchers, 7 press releases were categorized and analyzed by the main contents (demand for the use of a specific health technology or demand for a new policy), the type of press, and the demanding groups. For the literature review of similar policies in South Korea, we looked into related laws, regulations, and policy reports of the Ministry of Food and Drug Safety (MFDS), the Health Insurance Review and Assessment (HIRA), the National Health Insurance Service (NHIS), and the National Evidence-based Healthcare Collaborating Agency (NECA). We developed two frameworks for the quasi-emergency and emergency use of unlisted health technologies based on the results of the interviews and literature review, by considering domestic environments. Additionally, we also developed the details of the application criteria, requirements, and a detailed review and approval process. We gained the following information from our interviews with the 6 representatives of patient and consumer organizations. Regarding the first question, all representatives were in agreement regarding the necessity of the use of unlisted health technologies in emergency and quasi-emergency situations. Second, regarding the specific needed areas (multiple answers were allowed), the responses were emergent cardiovascular disease (5 people), emergent cerebrovascular disease(4 people), incurable cancers (4 people), and rare diseases (2 people). In addition, they said that these listed diseases have to be supported preferentially more so than any other diseases in emergency and quasi-emergency situations. Third, regarding the development of related health policy frameworks, they suggested the framework for emergency situations has to allow for ‘using in advance and post approval’ and the framework for the quasi-emergency situations have to address an ‘advance verification system’ for using the unlisted health technologies. Fourth, regarding the willingness of paying for the cost, all of them agreed to pay the treatment or diagnosis fee voluntarily. Finally, regarding additional opinions for the development of frameworks, four of the individuals said that public research institutions (e.g. NECA) have to support the decision making of the Committee for nHTA through the analysis of submitted reports from the implementing medical institutions, the investigation of related documents, and the review for the appropriateness and the abuse/misuse of health technology applications in both situations. As Table 1 shows, after the elimination of press releases with the same or similar contents, there were a total of 7 press releases that dealt with the demand for the use of newly developed, but unlisted, health technology [15–21]. The first press release was about the need to establish systematic countermeasures applicable in situations such as when there are no alternative medical techniques, with the patient’s consent; this has been continuously presented and demanded by the National Assembly of Korea, at the national policy level, by medical staff and patient groups since 2010 . In particular, in cases of recent artificial heart transplants and trans-sutural distraction osteogenesis, domestic medical staff and patient groups have been assertively demanding the application of newly developed technology because domestically the corresponding health technology was not allowed, whereas it was allowed in foreign countries [19–21]. Table 1: Press releases related with the demand for the use of newly developed but unlisted health technologies in quasi-emergency or emergency situations in Korea. There are two types of policies for the use of unapproved drugs in an emergency. One is the “treatment use of an investigational new drug” policy and the other is the “emergency use of an investigational new drug” policy [10,22]. Table 2 shows those processes in detail. Although the conditions for authorization and related laws and regulations are different, the procedures are similar [10,22]. First, applicants have to submit an application form, which the MFDS subsequently reviews [10,22]. If the application is appropriate, the MFDS authorizes the use of the investigational new drug. Next, the applicants have to acquire IRB approval and patient consent [10,22]. Then, they have to collect the information on adverse reactions and follow-up observation results [10,22]. Finally, they have to submit a report on drug use results (including the adverse results and follow-up observation results) to the Minister of the MFDS [10,22]. Both of these policies require prior approval from the MFDS, but there is little distinction between them. Thus, this may negate the purpose of the latter policy targeting “emergency” situations. Table 2: Authorization schemes for the treatment and emergency use of investigational drugs and unapproved medical devices in Korea. 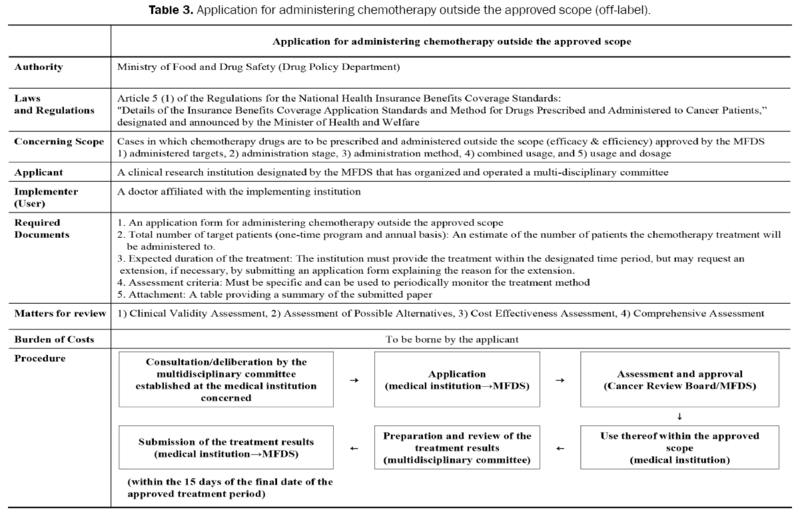 Another type of policy is the “Application for administering chemotherapy outside the approved scope.” As Table 3 shows, for the treatment of cancer patients, a hospital designated as a clinical research institution by the MFDS can apply for the ability to administer chemotherapy outside the approved scope under the Regulations for the National Health Insurance Benefits Coverage Standards [23,24]. In this case, applicants have to submit the application form, the total number of target patients, expected duration of treatment, and assessment criteria to the Cancer Review Board in the MFDS [19,20]. After assessment and approval by the Cancer Review Board in the MFDS, applicants can use chemotherapy within the approved scope, but they have to submit the treatment results to the MFDS within 15 days of the final date of the approved treatment period [23,24]. Table 3: Application for administering chemotherapy outside the approved scope (off-label). Table 2 shows two types of policies for the use of unapproved medical devices. In the case of the use of an unapproved medical device for treatment, applicants have to acquire IRB approval before using those medical devices . After use, they must submit the case report form to the Minister of the MFDS . However, in the case of emergency use of an unapproved medical device, the treating doctor may use an unapproved medical device without prior IRB approval, however, he/she is required to submit a report on the results of its usage ; this may be a cause for concern because it can lead to indiscriminate use of unapproved medical measures. However, under the current system, there is no clear distinction between “treatment use” and “emergency use” as the definition of “emergency patients” itself is vague. Moreover, the provisions defining emergency situations are those deemed as such by “a doctor, etc.” or by “a specialist” and this may lead to a high number of exceptional cases because they are chosen based on subjective discretion and a vague scope of emergency situations. To develop the rigid and acceptable frameworks and their detailed processes, we first have to define quasi-emergency and emergency patients. Quasi-emergency patient: A quasi-emergency patient is one for whom there are no treatment alternatives and a newly developed health technology must be performed as the last resort; this would include a patient who will likely be in a lifethreatening situation if a newly developed health technology is not provided within a matter of days or months, or any persons in a similar situation. Emergency patient: An emergency patient is one who is at risk of receiving critical damage to the heart or brain function in their current state; specifically, it is a patient who will likely be in a life-threatening situation if a newly developed health technology is not provided within a matter of hours or days, or any persons in a similar situation. Individual approval for quasi-emergency patients: This refers to pre-review approval given by the Ministry of Health and Welfare (MOHW) to use a health technology that has not yet been subject to a nHTA for a review of its safety and effectiveness (as per Article 53 of the Medical Service Act ) on a quasi-emergency patient. Individual approval for emergency patients: This refers to a post-review approval given by the MOHW to implement a health technology, which has not yet been subject to a nHTA for a review of its safety and effectiveness as per Article 53 of the Medical Service Act, on an emergency patient with a condition for which there are no alternative treatment measures available. This is an approval system for the use of unlisted health technology for individual quasi-emergency patients. For the use of this system, prior approval by the Committee for nHTA is required. Criteria and minimum requirements for implementation: First, the patient should meet the definition of a quasi-emergency patient. Second, the corresponding health technology must not have been subject to a nHTA for a review of its safety and effectiveness. Third, accompanying drugs or medical devices must be approved by the MFDS. Finally, treating doctors have to get the informed consent from the patient or his/her legally authorized representative. 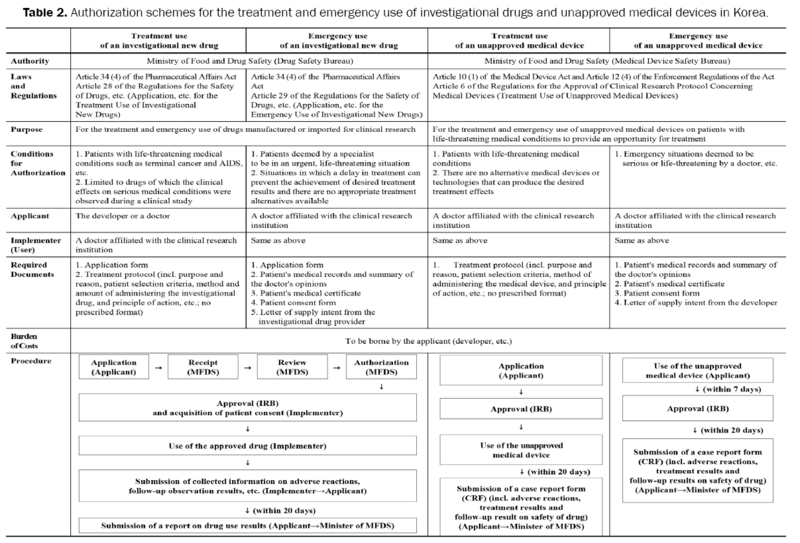 Process: As (Figure 1) shows, in the cases of quasi-emergency patients, where there is a newly developed, but unlisted health technology in the Korea NHI system, a medical doctor who intends to use that health technology can submit the application documents to their institutional IRB. In that case, the IRB reviews the appropriateness of the application, and if they deem it appropriate, they can transfer the application documents and the quasi-patient confirmation letter to the Center for nHTA, which is part of the NECA in South Korea. Then, the Center for nHTA confirms the minimum requirements and arranges the review of the Emergency Subcommittee and Committee for nHTA on the appropriateness of the application and checks the details (i.e., satisfaction that the patient is defined as a quasi-emergency patient, appropriateness of the documents for the IRB’s approval, and the patient’s consent). If the process is completed, the Center for nHTA reports the results of the review to the MOHW and the MOHW issues an authorization certificate to the implementing institution. Then the treating medical doctor can use that health technology within the approved scope of application. After the use, the treating medical doctor has to prepare and submit a case report to the institutional IRB. Then, the related IRB has to review the case report and submit it to the Center for nHTA. 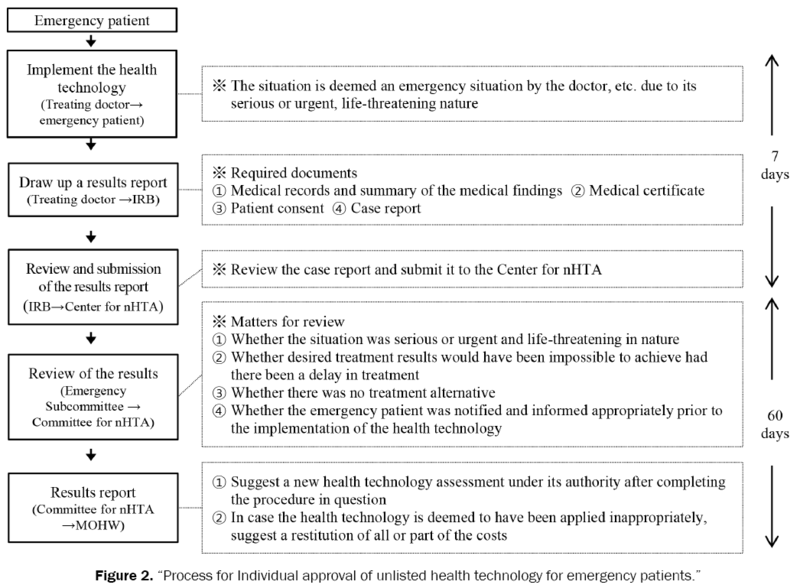 If so, the Emergency Sub-committee and Committee for nHTA review the report to determine ① whether the health technology was implemented in accordance with the application documents, ② whether desired treatment results would have been impossible to achieve or had there been a delay in treatment, ③ whether the quasi-emergency patient was notified and informed appropriately prior to the implementation of the health technology, and ④ whether there are concerns regarding abuse of the technology. Finally, the Committee for nHTA can suggest a nHTA under its authority after completing the procedure; but in cases where the technology is deemed to have been applied inappropriately, they can also suggest a restitution of all or part of the costs. This is an approval system for the use of unlisted health technology for individual emergency patients. If the situation is deemed an emergency by the treating doctor, he/she can implement the unlisted health technologies. Following this, they have to draw up the results report for the IRB; the IRB then submits the results to the Center for nHTA in the NECA and finally, the Committee for nHTA, under the MOHW, reviews the appropriateness. Criteria and minimum requirements for implementation: First, the patient should meet the definition of an emergency patient. The other requirements are the same as in the process for quasi-emergency patients. Process: As (Figure 2) shows, in cases with emergency patients where there is newly developed but unlisted health technology in the Korean NHI system, the treating doctor can implement the newly developed health technology when there is a serious or urgent life-threatening condition. After that, the treating doctor has to submit ① medical records and a summary of the medical findings, ② a medical certificate, ③ patient consent, and ④ a case report to the IRB. After a review of the case report, the IRB has to submit the results to the Center for nHTA in the NECA. Then, the Center for nHTA confirms the minimum requirements have been met and arranges a review by the Emergency Subcommittee and Committee for nHTA to determine ① whether the situation was serious or urgent and life-threatening in nature, ② whether desired treatment results would have been impossible to achieve had there been a delay in treatment, ③ whether there was no treatment alternative, and ④ whether the emergency patient was notified and informed appropriately prior to the implementation of the health technology. Finally, the Committee for nHTA can suggest an nHTA or, if the technology's use was inappropriate, they can recommend restitution of costs to the MOHW in the same manner as that described in the quasi-emergency process. The purpose of the proposed framework is to provide treatment opportunities to patients in life-threatening conditions or in conditions for which appropriate treatments are not currently available. In spite of the effort to remove the possibility of bias from the interventions of industries or hospitals, there will be some biased opinions in the press releases. However, there has been a constant need for the use of newly developed technologies in emergencies. Therefore, the two frameworks provided above can serve as prototypes for the approval process of the quasi-emergency and emergency use of unlisted health technologies. Although the intended purpose is positive in nature, there will be some concerns related to safety resulting from system abuse. There will also be risks related to ethical issues such as industry personnel or medical professionals’ misconceptions of these frameworks as a means to conduct and promote their newly developed products. As such, there is a need to reinforce the application requirements and the follow-up management system to prevent these systems from being abused as a means of collecting clinical data and protecting the human rights of patients. However, some interested parties will insist that applying stricter regulations for safety improvement will inevitably cause a reduction in the use of these systems. They may also assert that it could be a burden to the health professionals and patients due to the complex process, and that it is applicable only in the hospitals that have appropriate systems in place (e.g., those equipped with IRBs, practiced medical doctors, related medical devices, and competitive researchers). However, these frameworks are minimal safety devices for the use of unverified health technologies. Thus, the suggested principles must be abided by. To efficiently apply these frameworks in the Korean healthcare system, the most critical element is mutual agreement among the relevant persons of interest including the healthcare professionals, patients, their family members, and health policymakers. If the Committee for nHTA in the MOHW is assigned the role of approving the applications, it will be possible to judge the level of emergency and the possibility of treatment alternatives. However, there will be still concerns of confusion with the definition between “quasi-emergency patients” and “emergency patients,” and the proper cost of approved technology. Beyond that, if the approved health technologies are not implemented appropriately, the only disciplinary action that can be taken in the suggested frameworks is the total or partial restitution of the costs, without stricter punishments. Thus, the relevant departments within the MOHW and the relevant research institution (e.g., NECA) must prepare countermeasures for the problems mentioned in the above sentence. In addition, it is essential to provide education to the healthcare professionals to minimize abuse and misuse. Furthermore, if the research capacity of a related public institution (e.g., NECA) is available, it is also needed to create a new framework for the efficient and mass treatment or diagnosis using a newly developed but unlisted health technology in the case of a national emergency situation. The emergency use of unlisted health technologies can be a critical process; in the present study, we developed frameworks for the use of newly developed health technologies for patients in emergency and quasi-emergency situations. These frameworks will allow for timely medical treatment and diagnosis when alternative treatments or diagnostic methods are nonexistent. At the same time, they can be baseline safety nets for the use of unverified health technologies. Thus, understanding of these newly designed frameworks will inspire policymakers who are planning to grant permission for the use of unlisted health technologies in quasi-emergency or emergency situations through the amendments of related laws and regulations. These frameworks will encourage the adoption of newly developed health technologies through a stable and systematic operational process. Kauffman v. Franz. U.S. Dist. LEXIS 88749 (E.D. Pa. Sept. 24, 2009). University of California (UCI). Emergency use of an unapproved drug, biologic, or device. Nightingale SL, et al. Emergency use authorization (EUA) to enable use of needed products in civilian and military emergencies, United States. Emerg Infect Dis. 2007;13:1046–1051. Holbein ME, et al. Access to investigational drugs: FDA expanded access programs or “Right-to-Try” Legislation?.ClinTransl Sci. 2015;8:526-532. Jarow JP and Baxley JH. Medical devices: US medical device regulation. UrolOncol. 2015;33:128-132. Hernandez JE, et al. Clinical experience in adults and children treated with intravenous peramivir for 2009 influenza A (H1N1) under an emergency IND program in the United States. Clin Infect Dis. 2011 15;52:695-706. Williams CT. Food and drug administration drug Approval Process: A history and overview. NursClin North Am. 2016;51:1-11. Japan Industries Association of Radiological Systems. Prospects for development in medical equipment in Japan. Pharmaceutical Affairs Act, Ministry of Health and Welfare (Pharmaceutical Policy Department) and Ministry of Drug and Food Safety (Drug Policy Department). [Act No. 12074, Partially amended on Aug. 13, 2013]. [Enforced on Aug. 13, 2013]. Medical Device Act, Ministry of Drug and Food Safety (Medical Device Policy Department) and Ministry of Health and Welfare (Pharmaceutical Policy Department). [Act No. 12107, Partially amended on Aug. 13, 2013]. [Enforced on Aug. 13, 2013]. MedPAC. Report to the congress: Issues in a modernized Medicare program. New Jersey: MedPAC; 2005. Oh EH. Prohibition system of mixed care and new medical technology in Japan from Policy Trend of Health Insurance Review and Assessment Service. 2007;11:37–42. National Evidence-based Healthcare Collaborating Agency. The development of clinical guide for temporary approval of new health technology. Doctors News. Press release: Emerging need for “Conditional Coverage” of the newly developed health technology and drugs. Korea Health Log. Press release: Overseas countries have already systematized the stem cell treatments. Urgent need for relevant laws and regulations. Korea Health Log. Press release: Application of newly developed health technology should be expanded for the patients with rare and incurable diseases. Yakup News. Press release: Kim, Yong Ik, a member of National Assembly, repeatedly proposed bills for innovation of public health and medical services. News Chosun. Press release: Why are we not able to receive artificial heart transplants? Youngman Doctors. Press release: Why isn’t trans-sutural distraction osteogenesis for child patients with microcephaly being recognized for coverage? Youngman Doctors. Press release: Do we have to stand idle while my child is dying? Ministry of Food and Drug Safety (Drug Policy Department). Regulations for the safety of drugs, etc. [Prime Minister’s Decree No. 1022, Amended on Mar. 23, 2013]. [Enforced on Mar. 23, 2013]. Ministry of Health and Welfare. Regulations for the national health insurance benefits coverage standards. [Minister’s Decree No. 207, Amended on Sep. 13, 2013]. [Enforced on Sep. 19, 2012]. Ministry of Health and Welfare. Regulations for the standards and process of administering chemotherapy outside the approved scope. [Minister’s Decree No. 43, Amended on Jun. 25, 2010]. [Enforced on Sep. 19, 2012]. Ministry of Food and Drug Safety. Regulations for the approval of clinical research protocol concerning medical devices. [Act No. 11690]. [Ministry of Food and Drug Safety Notice No. 2013-53, Amended on Apr. 5, 2013]. [Enforced on July. 14, 2005]. Kim CY. Health technology assessment in South Korea. Int J Technol Assess Health Care. 2009;25:219–223. Ministry of Health and Welfare. Medical Service Act. [Law No. 10609, Amended on Apr. 28, 2011]. [Enforced on Jan. 1, 2014].